Marketplaces and prices shown matched UPC number 778988707036 during our search. MIX AND MATCH 6 NEW FABRICS: Use 6 new rainbow-inspired ribbons including a new unicorn pattern, to create colorful big bows! You can even make double bows, just like JoJo's! Mix and match fabrics to accessorize your outfit and reuse bows and clasps to create new combinations! GLITTER ACCESSORIES AND JOJO STICKERS: The JoJo Bow Maker includes everything you need to create! Choose from a variety of colorful glitter clasps and hair clips for your bows, and customize with even more sparkle by adding sticky gems and JoJo stickers! EASY TO CREATE: The Cool Maker JoJo Bow Maker lets you easily create colorful double bows just like JoJo's! No batteries needed - just scrunch, clasp and decorate! The Bow Maker also includes handy storage drawers! The Cool Maker JoJo Bow Maker is for Cool Makers aged 6 and up. Put the OMG in DIY and create and recreate endless bow combinations, just like JoJo Siwa's! The JoJo Bow Maker makes a great gift for any occasion. Cool Maker gives aspiring designers all the tools needed to make amazing creations they'll be proud to share. Scrunch, clasp and decorate your own hair bows just like JoJo Siwas with the Cool Maker JoJo Bow Maker; Make double bows inspired by JoJos signature style and mix and match to accessorise your outfit; The bow maker lets you easily design colourful big bows - choose from six funky fabrics and customize with glitter clasps, sticky gems and JoJo stickers; You can even change your bows as often as you change your outfits ; the ribbons are all reusable; just undo the clasp to create new bow combinations; express your jojo style with the cool maker JoJo bow maker; The cool maker JoJo bow maker lets you easily create colourful double bows just like JoJos; Includes storage drawers; Mix and match fabrics to accessorise your outfit and reuse bows and clasps to create new combinations; Add some sparkle to customise your bows with sticky gems and JoJo stickers; Cool maker gives aspiring designers all the tools needed to make amazing creations theyll be proud to share. Includes: 1 cool maker JoJo bow maker,. 6 bow clasps, 6 hair clips,. 1 grosgrain ribbon, 2 satin ribbons,. 1 organza ribbon, 1 glitter ribbon,. 1 rainbow ribbon, 1 sheet of sticky gems, 1 sheet of jojo stickers, 1 instruction sheet. Size H27.94, W35.56, D6.68cm. For ages 6 years and over. WARNING(S): Not suitable for children under 3 years old. Only for domestic use. To be used under the direct supervision of an adult. 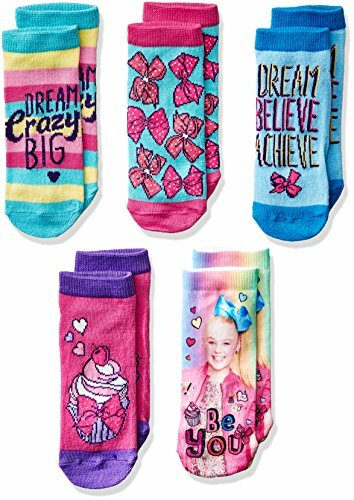 Scrunch, clasp and decorate your own hair bows just like JoJo Siwa's with the Cool Maker JoJo Bow Maker! Make double bows inspired by JoJo's signature style and mix and match to accessorize your outfit! The Bow Maker lets you easily design colorful big bows in a cinch. Choose from six funky fabrics and customize your bows with glitter clasps, sticky gems and JoJo stickers! You can even change your bows as often as you change your outfits - the ribbons are all reusable. Scrunch, clasp and decorate your own hair bows just like JoJo Siwa’s with the Cool Maker JoJo Bow Maker! Make double bows inspired by JoJo’s signature style and mix and match to accessorize your outfit! The Bow Maker lets you easily design colorful big bows in a cinch. 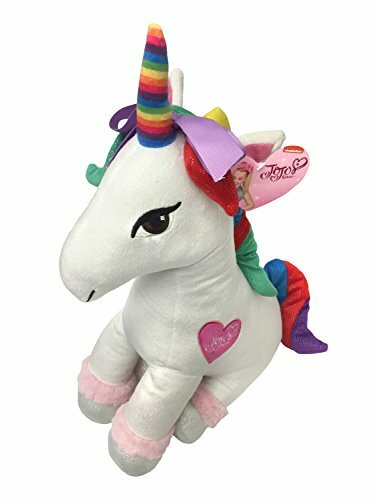 Choose from six updated fabrics including rainbow and unicorn patterns, and customize your bows with glitter clasps, sticky gems and JoJo stickers! You can even change your bows as often as you change your outfits! The ribbons are all reusable; just undo the clasp to create new bow combinations! Put the OMG in DIY and express your JoJo style with the Cool Maker JoJo Bow Maker! 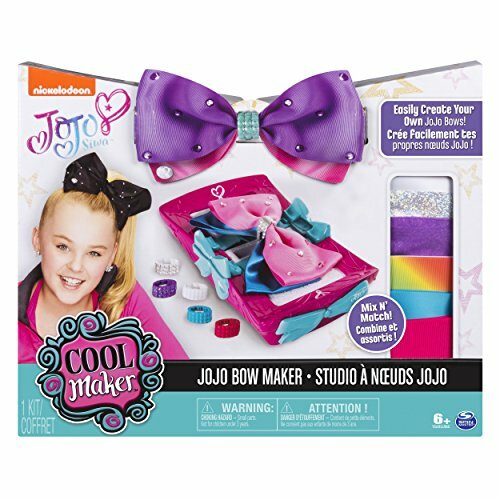 The Spin Master JoJo Siwa(tm) cool bow maker lets you easily create your own JoJo bows! You can mix and match fabrics and clasps, decorate the bows with gems and JoJo stickers! this also includes storage for your creations! Plastic. Ages 6 and up. WARNING: CHOKING HAZARD - Small Parts. Not for children under 3 years. MIX AND MATCH 6 NEW FABRICS: Use 6 new rainbow-inspired ribbons including a new unicorn pattern, to create colorful big bows! You can even make double bows, just like JoJo’s! Mix and match fabrics to accessorize your outfit and reuse bows and clasps to create new combinations! EASY TO CREATE: The Cool Maker JoJo Bow Maker lets you easily create colorful double bows just like JoJo’s! No batteries needed – just scrunch, clasp and decorate! The Bow Maker also includes handy storage drawers! The Cool Maker JoJo Bow Maker is for Cool Makers aged 6 and up. Put the OMG in DIY and create and recreate endless bow combinations, just like JoJo Siwa’s! The JoJo Bow Maker makes a great gift for any occasion. Cool Maker gives aspiring designers all the tools needed to make amazing creations they’ll be proud to share. Scrunch, clasp and decorate your own hair bows just like JoJo Siwa&apos;s with the Cool Maker JoJo Bow Maker! Make double bows inspired by JoJo&apos;s signature style and mix and match to accessorize your outfit! The Bow Maker lets you easily design colorful big bows in a cinch. Choose from six funky fabrics and customize your bows with glitter clasps, sticky gems and JoJo stickers! You can even change your bows as often as you change your outfits - the ribbons are all reusable; just undo the clasp to create new bow combinations! Express your JoJo style with the Cool Maker JoJo Bow Maker!